Take for example the ‘student of the week’. A staple of many primary schools. 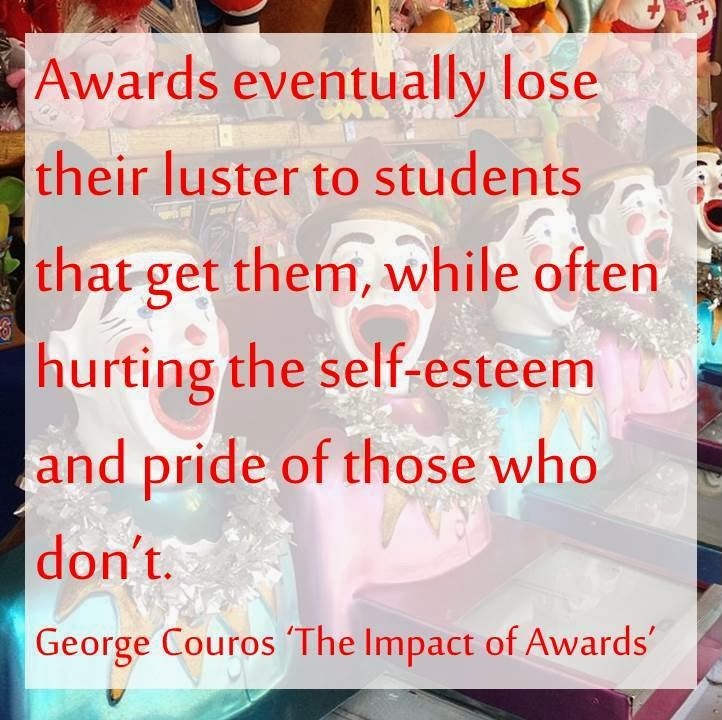 In another post Couros argues that such awards are often handed to the detriment of the students, rather than to their advantage. The reason being is that different items are often found for awarding students. For if such awards were based on academic results then they would often go to the same student every week. The problem with this is that the focus should be on students being good students, rather than being recognised at an assembly. Couros’ solution is to reverse the situation and instead of teachers randomly choosing an item, give this responsibility to the students. That way the students still get 15-minutes of fame, but they also get to share something important to them, a little bit of their story, rather than the story that is chosen for them. Another scenario where celebrations and encouragement isn’t always so positive is during staff meetings. I was in a planning meeting the other day where it was suggested that staff should always do background reading before preparing a unit of work, to provide the best possible platform to construct the topic on. I could not agree more, having a clear foundation can help to alleviate any confusion, as well as support deeper learning. The problem though was that one staff member was then identified as a great example of this in action. That they did not just rely on a textbook or a curriculum document, instead they grappled with a wide range of sources in coming to grips with topic at hand. Now I have two problems with this situation. Firstly, if the focus is on the skill of preparation, does it actually achieve anything to highlight the prowess of a particular person? Does this actually add anything of value? While secondly, in celebrating someone’s successes, it can be easy to overlook the context of the situation. For example, the teacher at hand takes three different classes of the one subject. This is a large chunk of allotment, three quarters to be exact. This compared to another teacher who takes six different subjects, none of which are repeated. It seems unfair to compare. In regards to teachers, if the focus is on celebrations and providing encouragement for individuals, then maybe the solution is to provide a time in every staff meeting for one member of staff to share something worthy of celebrating. Just as Couros suggests that students take on the responsibility of choosing what they share, why do we not do the same with teachers. Why not let them know ahead of time that they will be sharing and instead of making everyone awkward by only focusing on the few. For in today’s day and age where the focus of leadership is an agreed set of goals and values, surely it misses the point to then celebrate the deeds of a small few. In the end, just as it misses the point to focus on technology as a tool, so to does it miss the point to celebrate the person, rather than focusing wholly and solely on the skill or goal in question. The reality is that in education parlance reference is usually made to ‘best practises’ not ‘best people’, maybe then that should be the focus. When Encouragement isn’t so Encouraging: A Meditation on Rewards and Celebrations by Aaron Davis is licensed under a Creative Commons Attribution-ShareAlike 4.0 International License.